If you are a deer hunter with internet access you've likely spent dozens or even hundreds of hours researching mast crops for deer online. At some point in time you've skipped passed corn, soybean, brasica, and focused on planting a long term solution. A solution that will outlast even perennials like ryegrass and some clovers. A food source able to provide food even when you don't feel like shelling out the $10+ for a bag of corn. There really is only one solution...trees. A good tree like a White or Red Oak and even a chestnut hybrid will provide food for your deer herd for decades and possibly even centuries. Granted there are other tree options like apples, persimmons, and even pears, but today we will be focusing acorns and chestnuts. What this article is: This article is meant to display all the common knowledge in regards to oaks,and chestnuts. We will also provide some common sense tips that may save you time and money. 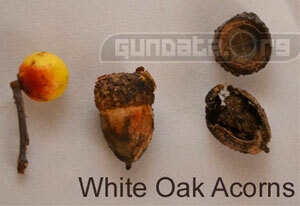 As any good deer hunter can tell you white oak acorns are the preferred food source for deer "when they are falling". They have lower tanin levels making them less bitter than the red acorns. White oaks are kinda like the blackberry of the acorn world. They are an amazing crop but only last a few months both because they are usually eaten so quickly and the fact that they have less tanin means they will rot quicker. If you want to hunt using white oaks the best bet is to find one and not plant one as they will take years or decade before they will begin yielding a harvest. Identification: There are all sorts of names for species of white oaks. The main identifying factors are the rounded leaf tips, and the whiter/lighter bark. Hardy once it reaches "adult stages"
Only produce good crops one out of 4 years, and sadly no one knows why. Low tanic acid content means they will rot once they hit the forest floor. 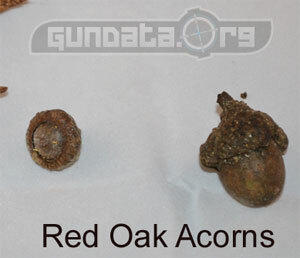 Red oak acorns are the second choice of deer because they have higher tanin (tanic acid) content making them taste bitter. This tanic acid does however prevent the acorn from rotting so quickly. This means that the acorn provide better year long food sources for your herd. Find a red oak and look under the fallen leaves near any time of the year and you will likely find acorn that have not yet rotted. Identification: Red oak leaves have sharper points, and the bark is darker and more rough (especially as the tree ages) Again there are all sorts of name for individual red oaks. High tanin count means acorns are rot resistant. Bitter because of higher tanic acid count. Takes 15 mo for the acorns to mature and fall. One of dozen or so Chestnuts we are growing for our grove. Marketing: There has been tons of marketing pushing chestnuts lately. We even bought some dunstans and planted them ourself. These new trees are said to produce nuts after just 3 to 5 years, and they grow fast. Produce a crop every year. Chestnut blight may kill non hybrid trees. Deer may no longer be familiar with this nut. So which is the best...the white, the red, or the chestnut? The answer is simple. The best tree is the one you don't have. Look around your land and identify your trees. If you have white and red oaks then you might want to make room for a small chestnut grove. 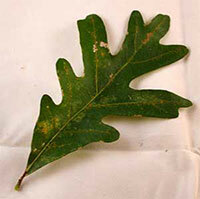 If you only have red oaks then you might want to plant both white oaks and chestnuts. 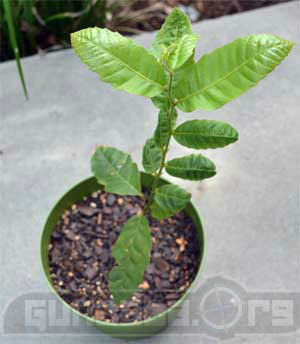 If you have white and reds then plant a few chestnuts. Having all three will make your deer herd healthier and and larger in both size and numbers. What if you only have room for 1 species? If limited by acreage and you can only plant a few trees? This is a tough question to answer. Deer in your area most likely have no clue what a chestnut is due to it's rarity, and white and red oaks take a long time to produce and when they do produce they do so every few years. We are not sure what the answer to this question is so please let us know in the comment section below what you think the best mast tree is. Thanks for reading and please be sure to share and like this article.